The Granite Gurus: FAQ Friday: What is Soapstone? FAQ Friday: What is Soapstone? 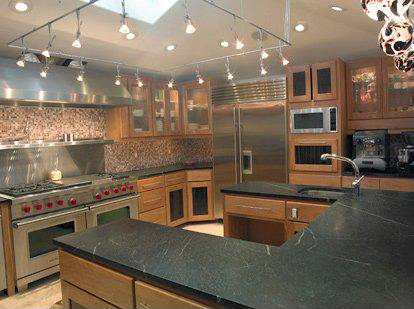 Soapstone is similar to granite, marble & limestone. Yet it has some distinct and unique characteristics that put it in a category of it's own. The name 'Soapstone' is used to describe many different kinds and colors of stone that are primarily made up of Talc. These forms of soapstone are used for carving due to its softness. 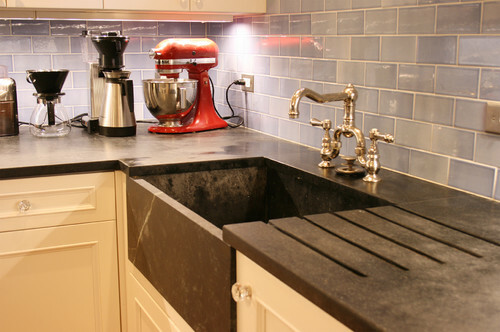 Soapstone countertops and gorgeous sink. Designed by Anthony Catalfano Interiors. The architectural grade of Soapstone (that we use for countertops, etc) is technically called a Steatite. It's still primarily composed of talc but it also contains other minerals, like magnesite, dolomite and chlorite, which makes it a harder and more dense formation of the stone. Soapstone is generally 300-400 million years old depending on what country it is quarried from. It is quarried from all over the world. The Soapstone we use here in Utah is primarily from Brazil. 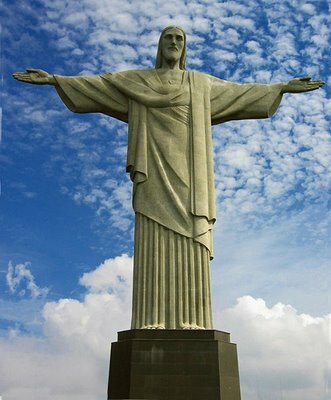 The Cristo Redentor in Rio de Janeiro is made of Soapstone & reinforced concrete. True Soapstone is inert. Alkalis and acids won't affect or etch the surface like they do with the calcium based stones (marble, limestone, travertine). Many people think of Soapstone as the surface used in science classrooms and labs. This is due to it being inert and it's longevity. You will also see Soapstone widely used in wood stoves, fireplace liners, masonry heater fireplaces, pizza ovens, etc. It has remarkable natural heat retention. It heats up quickly and then slowly radiates the heat evenly for hours on end, even after the fire has gone out! Historically Soapstone has been used around the world for tools, vases, sculptures, carafes, goblets, fireplaces, bed warmers, building blocks, urns, grave markers and more. 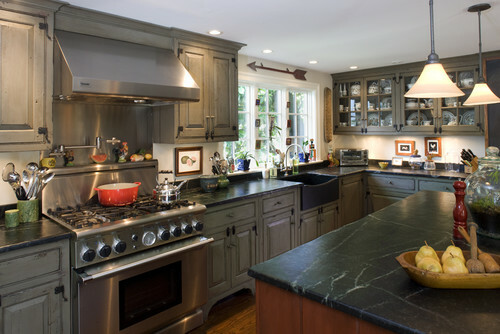 Currently the most popular ways to use Soapstone are for countertops, sinks, ovens, fireplaces and stoves. A lot of people think Soapstone is really porous because it's soft to the touch. This isn't true. Any stains or discolorations are just off the surface. This means they can be cleaned, scrubbed and/ or sanded off. This includes the mineral oil that you put on it. If you decide you don't like the darker appearance it can be refinished and the Soapstone will go back to looking like it did in it's natural state. I highly recommend using mineral oil or beeswax on Soapstone countertops. This is purely cosmetic. Soapstone will naturally darken with age. By using mineral oil or beeswax on Soapstone it brings out the dark, rich colors in the stone. Treating it initially just speeds up the aging process. The mineral oil or beeswax will also work as a protective sealing layer to the surface of the stone. That being said...some people never apply anything to the stone, it does eventually take on it's own natural patina with regular use. 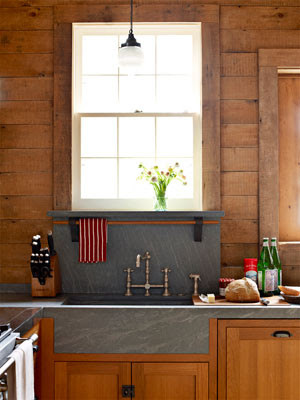 If I were to design my next kitchen today my countertops would be Soapstone. Hands down. I love the beauty, simplicity and the natural/living look of it. If you are considering Soapstone please contact us for a free estimate. We are also happy to talk through any questions and/or concerns you may have.